A woman stands at a symbolic memorial at Technologicheskiy Institute subway station in St. Petersburg, Russia, April 5, 2017. 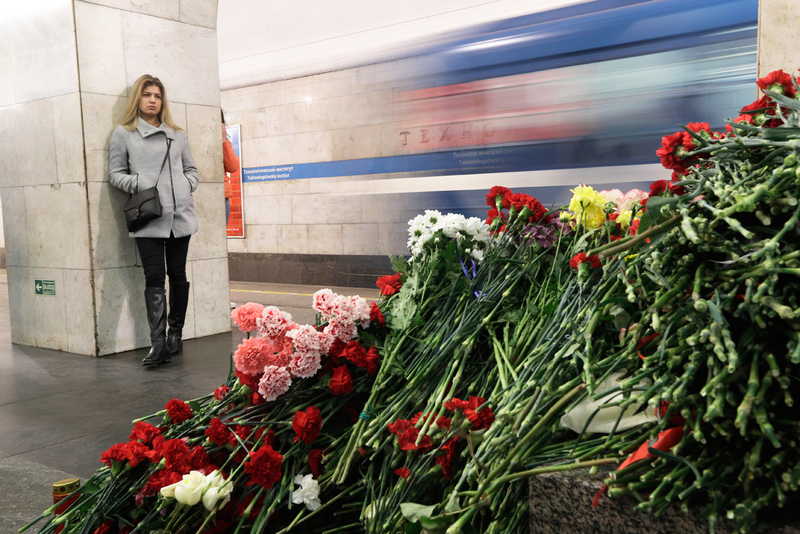 The April 3 bombing on the St. Petersburg metro claimed 14 lives, but it’s not the only terrorist attack in Russia recently. Militants are striking in areas that once were calm: two police officers were killed in Astrakhan, and an explosive device went off outside a school in Rostov-on-Don. Experts believe this recent wave of attacks may be revenge for Russia's fight against terrorists in the Middle East. In the early hours of April 4, just 10 hours after the blast on the St. Petersburg metro, a heinous crime was committed in Astrakhan, a city 800 miles southeast of Moscow. Two traffic police officers arrived at the scene of a road accident, and as they were doing paperwork inside their vehicle, passengers from one of the two cars involved in the collision shot both officers through the windshield. They succumbed to their injuries before medical personnel could arrive, and the attackers made off with the officers’ weapons. The Astrakhan Region’s governor, Alexander Zhilkin, blamed the attack on radical Islamists. The perpetrators were arrested two days later, in the night of April 5, when a National Guard patrol pulled over a car for inspection but was fired upon. The attackers fled, but were found and trapped the next morning. Four of the militants were killed in a shootout and two others detained. Investigators say the same men who killed the police officers two days prior also attacked the National Guard patrol. The Investigations Committee reports that one of the attackers had an audio file “in which he expresses extremist views and promotes violence.” Later, the Islamic State said it had ordered the attacks. In another southern Russian city, Rostov-on-Don (600 miles south of Moscow), an explosive device was left outside a school early on April 6. A video disseminated via media shows a black-clad man placing a package outside the school building, and quickly leaving. Then another man, apparently a street cleaner, is seen approaching the package and picking it up, after which the device explodes. The man who inadvertently detonated the device lost an arm and a finger on his other hand, and is currently in serious condition. Investigators believe the improvised explosive device was disguised as a flashlight. The police inquiry is treating this incident as an attempted homicide, but investigators do not rule out terrorism. Goncharov recalls that on March 24, about a week before the St. Petersburg metro blast, militants attacked a National Guard unit in the Republic of Chechnya, killing six servicemen. “This spring we’ve witnessed a spike in activity of the extremist underground,” said Goncharov, adding that the recent wave of terrorist attacks are revenge for Russia’s fight against the Islamic State and other Islamist groups in Syria. Yevgeny Satanovsky, president of the Institute of Israeli and Middle East Studies, concurs: “Indeed, radical Islamists have been active recently. Not only that, but they also changed their tactics, and instead of major terror networks the Islamists are now often represented by individuals or small cells comprising two or three members.” Satanovsky said this tactic is effective: the smaller the terrorist group, the harder it is for security services to stop them. Goncharov believes the recent attacks were perpetrated either by sleeper terrorist cells, which had been lying low and biding time, or by militants of Russian or Central Asian origin who had returned from Syria and Iraq, where the Islamic State has been suffering one defeat after another. “Whereas previously they would take revenge on Europe, now they’ve turned their attention to Russia, unfortunately,” said Goncharov.